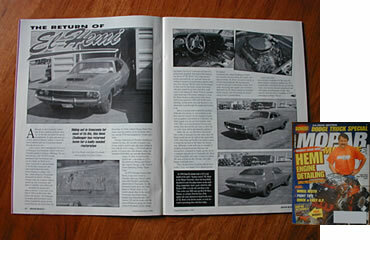 "A feature article in the August/September 1996 issue of Mopar Muscle ran the headline "The Return of El Hemi." In the article, written by Greg Rager and Juan Escalante, the story of EL HEMI comes to life. .you can almost feel yourself going back to 1969 Detroit and the annual auto show in Cobo Hall. The next thing you know, a '70 Hemi Orange Hemi Challenger is parked in your driveway and you spend the next several years, first in Detroit and then in Venezuela, driving the car and building the legend of EL HEMI. If you are a young Juan or Gus Escalante, you spend hours looking at the car, working on it when your dad would let you, and dreaming about the day you'd drive it. Then, after you've had a few turns at the wheel, a serious parts shortage condemns EL HEMI to the garage for the next 10 years, until Juan and his brother Gus embark on their mission to bring EL HEMI home and bring it back to life. "I remember while attending high school in Caracas, Venezuela waiting patiently every month for the next issue of Hot Rod or Car Craft magazine. There was a specialty bookstore near my high school that sold U.S. published magazines. I spent many hours staring at the pictures inside the pages of these two magazines wishing one day I would see El Hemi featured in it. 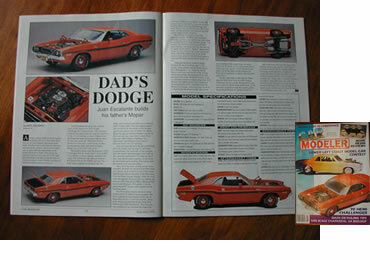 I guess that is where it all started, my dream to see El Hemi featured in a major performance magazine. Years later when the time drew near to bring El Hemi back to the U.S. I contacted then Mopar Muscle Editor, Greg Rager. 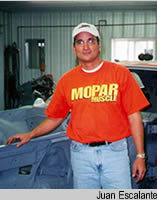 Greg took interest in the story and published "The Return of El Hemi" in the Mopar Muscle August 1996 issue. Needless to say, I was very happy to see El Hemi featured in Mopar Muscle. Of course now the goal is to see the car featured in a magazine after its restoration!" A 1995 article by Mike Siegman for Car Modeler magazine offers a fascinating look at how a car model came to life in the hands of Mopar enthusiast Juan Escalante, as an exact miniature of his father's 1970 Hemi Challenger. Juan took a basic Monogram 1970 Challenger T/A model, and with parts from several other kits, many hand-built assemblies, and the patience of a confirmed craftsman, it became an accurately detailed 1/24th scale replica of EL HEMI. From the authentically and highly detailed Hemi engine (including spark plugs and wire harness) to the factory-applied Hemi Orange overspray, this accurate replica took over 300 hours to create!